Kanchana and Hemavathi, Kalamkari artists at DWARAKA are ideal leaders to showcase the strength of rural women artisans. Belonging to family of weavers, in their younger days they supported family members by spinning the wheel while their parents worked on the loom. However the handloom weavers of Srikalahasti region were beginning to lose their livelihood options as machine looms began to replace the handlooms. Kanchana and Hema took it on their young shoulders to get their family out of debt. 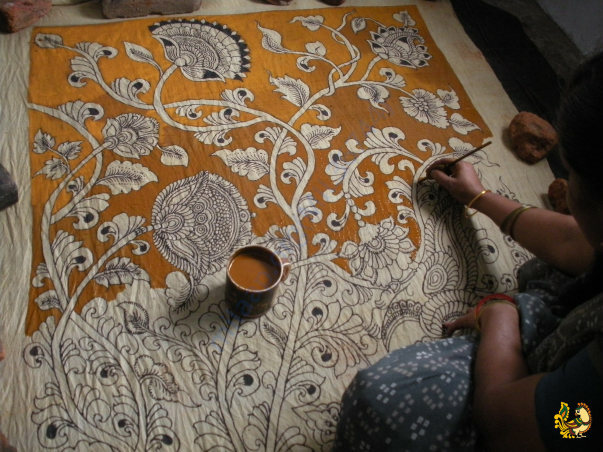 With hard work and determination both of them mastered the hand painted kalamkari art over the years. Kanchana is evolved to be a master artisan, while Hema is an artist par excellence and both their work sells at a premium in the market. Hema has also been the main executive member of the team learning on the job to manage the artists’ statutory books and Kanchana won Young Artist Award by Craft Council of India. 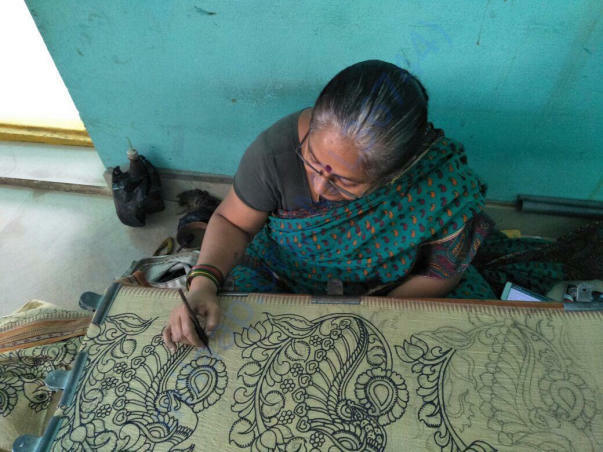 DWARAKA is enthralled by many such success stories of Kalamkari artists who have broken the shackles to reach success and be the leader of their families, primarily women. DWARAKA has evolved into a brand recognized for reviving and encouraging traditional hand painting skills and promoting eco-friendly ways to transform designs using only natural dyes. 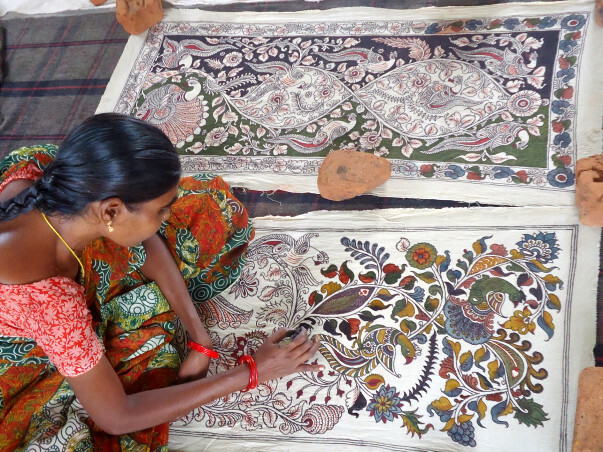 Thus reviving the true authenticity of Kalamkari craftsmanship and art focused approach in its various initiatives to transform into many sustainable ways of livelihood for the communities. DWARAKA comes together with International Folk Art Market, Santa Fe, to represent the traditional hand painted kalamkari at the International Art Festival to be held in July 2018. This year Santa Fe International Folk Art Market marks 15 years of art and impact as 162 folk artists from 53 countries gather at the world’s largest, most diverse folk art festival to celebrate cherished craft traditions and contributes to global unity and economic change. We are extremely happy and proud to salute the women and this opportunity is a tribute to their hard work and determination. We are seeking monetary support to present craftsmanship of the DWARAKA women artisans at a large scale and establish in a global market and network. Encouraging all supporters to help fund this effort, which will help evolve master designs, adopt innovative approach to global needs and uplift the hand painted artwork. While the Folk Art Market, Santa Fe is rooted in a reverence for tradition, it has also been a pioneer in supporting artists to move their traditions forward in culturally and economically sustainable ways. Its long-running Mentor to Market program again offers multi-tiered training and education, from basic business and marketing skills to intensive training partnerships with accomplished business mentors, to hands-on experience in the wholesale marketplace. This is a huge step for us to tap into the growing market potential and helps outreach the legacy of the art revival program. Thus far, as a contribution from the organization and our current supporters we have raised Rs.1,50,000. Your support and donations will help socio - economic development of the communities.